Have you used Paper by 53 Design? It's that iPad drawing app that is so decked out in pretty, design-y, feel-good-ness that it makes all who use it feel like Matisse. Well, now its creators have put out an equally gorgeous stylus. 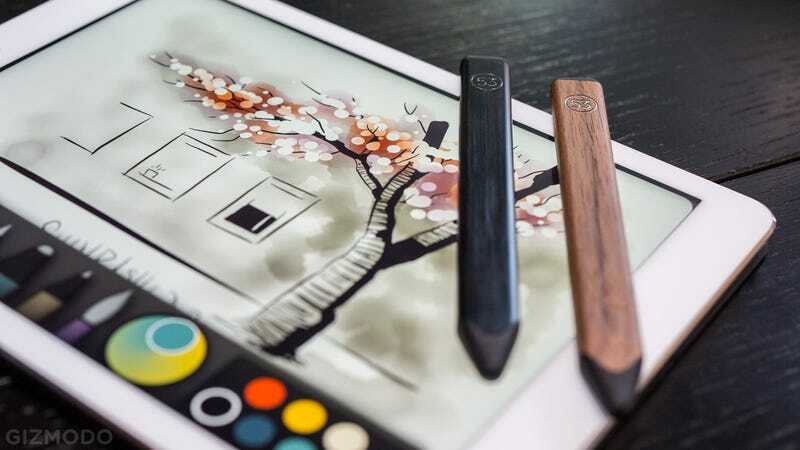 The appropriately named Pencil is a bluetooth stylus that pairs with the Paper app for iOS to let you more naturally sketch and write digitally. It's true, there are many bluetooth styluses out there and most of them offer similar features, such as palm rejection. Pencil wants to set itself apart mainly with that powerful weapon which catapulted the Paper app to stardom—good design. The first thing you notice about Pencil is the shape. It was designed to look like a traditional carpenter's pencil, with broad flat sides and chiseled tip. The exterior shell is even made of real walnut sustainably grown in Wisconsin (you can also get a graphite-inspired metal version for $10 less). You will also notice that there are no buttons on the side. Pencil's designers wanted to make the device as simple as possible. This makeup is the result of a focused design team led by John Ikeda and Jon Harris, both of whom helped design the Xbox 360. The elegance and small touches to Pencil, like the inlaid Fifty-Three logo, are what they hope will draw customers to this stylus over others. Pairing Pencil with Paper requires a physical 'kiss' where you touch the stylus to a button on the software's interface instead of accessing a menu item. Once it's paired, Paper handles palm rejection like other styluses, but goes one step further by knowing when you're performing gestures you actually want to perform with your fingers. You can pinch to zoom into your drawing's detail, for instance, and also blend strokes together like pastels. Flip Pencil around and you'll find an eraser for easy backtracking. The one feature that Pencil lacks is pressure sensitivity, which is an interesting choice on behalf of Fifty Three, seeing as how that's the headline feature for similar bluetooth styluses. Perhaps they didn't think they could implement it reliably enough, since it is not exactly perfect on other devices. But Pencil's greatest asset is the reputation of Paper, which captured people's imaginations by really understanding and developing a touch-based UI that is a pleasure to use. If the company can carry that focus into this new product category, it has the potential for great success when it ships for $60 ($50 for the non-wood version).